Full color both sides 4/4. 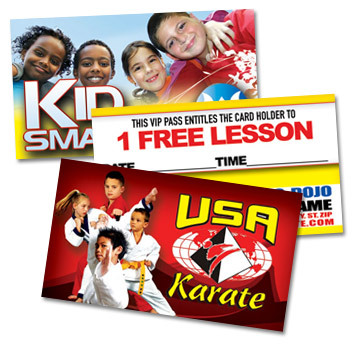 Hand out Dojo Power Cards at public functions, or random crowd gatherings. These one off meeting events may be the only time to present your services to these people. Our business card size products are a great way to introduce your business or yourself to your clientele in a stylish manner. You never get a second chance to make a first impression, and the DOJO predesigned templates are sure to make you stand out amongst your competition. You'll leave a lasting impression on your clients and business associates. • Red Ribbon Week ... and many categories added periodically!!! Custom Design Fee (Original/Not from template): Additional $75. 12pt (thick) stock; Full color both sides 4/4. ... and many categories added periodically!!! 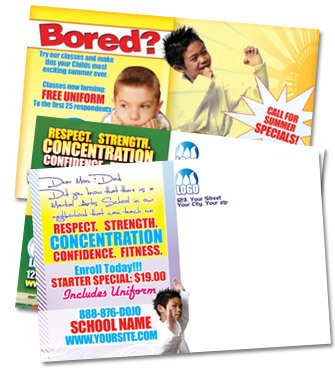 An effective direct mail campaign can be the key to making everyone in your area aware of your existence and generate new business for your school. THE PRINTING DOJO can also provide you with targeted mailing services, as well as list building based on your demographic requirements; CLICK HERE to learn more. Save time and money by using our direct mailing services. We can design, print & mail your postcards without you having to be bothered with anything other then approving the design artwork! We can use your existing mailing list or create a targeted mailing list based on your demographic specifications and requirements. 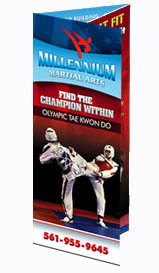 Receive maximum postage discounts from the U.S. Postal System, and eliminate the costs of having the cards shipped to you. 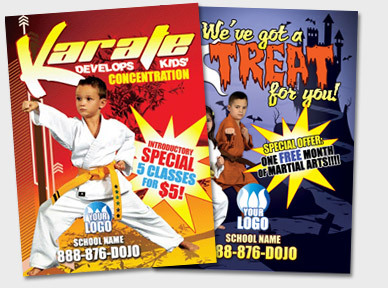 When you are ready to present in a detailed manner all the services and products you provide at your dojo, you may require more writing space then a flyer will allow; Brochures are a great way to inform your new potential students of your complete list of services. At this time all brochures are custom designed. Design Fee Starts at $350. 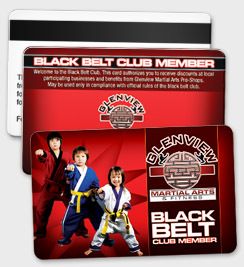 Plastic cards are becoming a popular marketing product that is attractive to both merchants and customers. One of the principal uses is as membership cards. They can also be used as Vip Passes to attract new students, and engender loyalty. Plastic Cards are available with the options: Embossed Sequential Numbering, Foil Stamped, Signature Panel, Programmable Magnetic Stripe. . 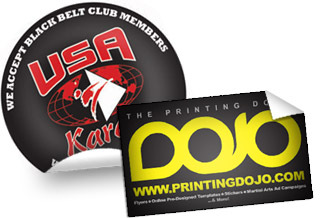 THE PRINTING DOJO is your one stop shop for all your printing needs, including adhesive stickers and labels. All labels are custom designed and custom quoted. Full color labels are more expensive then single color jobs. If you are providing your own artwork, in order to print a 2 or 3 color ink job, you must provide a color separated vector logo or artwork (.eps) file. Please fill out the quote request form to receive a quote within 24 hours. THE PRINTING DOJO is known for our high quality printing products and our pre-designed customizable templates, however sometimes you may need completely original artwork custom designed for you and THE PRINTING DOJO’s highly skilled graphic designers will be there to help you; From custom branding to flyers, brochures, and product catalogs, no job is too big or too small. Our website templates are a great solution for many of our clients, however we are here to help you design a completely custom site should you wish to develop one. If you are interested in a custom quote, please fill the form and a Dojo representative will contact you to further discuss.